After writing about outdoor explorations in Southern Utah for more than a decade I figured I had at least heard about all the iconic local trails, even if I hadn’t hiked them myself. Then a few years ago someone mentioned The Vortex. I was unfamiliar with the name, the hike and its central feature: a massive sandstone bowl with surprisingly steep and deep sides. The first time I saw a photo, I knew I had to see it myself. But that was a few years ago. For some reason, I just kept putting off the visit. Fast forward to last week. It was almost exactly one week after I was laid off from The Spectrum & Daily News as part of corporate-wide reduction in force (The Spectrum’s parent company, Gannett, eliminated many jobs that day, including this 13-year veteran of community journalism). But I kept one pre-layoff appointment: Steve Wattles, owner of Red Dirt Excursions, wanted to meet with me and tell me a little about his business. While talking with Steve, one of us mentioned The Vortex. When we realized neither of us had been there but it was on our respective short lists of must-do hikes in Southern Utah, we made plans to travel there the very next day. Now it’s Friday morning as I climb into Steve’s appropriately red Jeep with a Red Dirt Excursions logo on the side and we point ourselves toward Gunlock. The Vortex is accessible via the Lower Sand Cove Trailhead on Lower Sand Cove Road. This dirt road runs generally west to east between the unincorporated communities of Gunlock and Dammeron Valley. Although it’s a dirt road, it’s fairly well-maintained and should be passable for most passenger vehicles except when wet. The trailhead is closer to the Gunlock side of the road, so we approach from that direction. The turnoff is located just south of the bridge over the Santa Clara River at the south end of the Gunlock community. It breaks off from the east side of the Gunlock Road and makes a steep climb up the hill. Once on top, the road heads generally eastward past Lower Sand Cove Reservoir to the south. After passing the reservoir, the road turns south and then sharply east as it crosses a canal. Immediately after crossing the canal there is a sign for the Lower Sand Cove Trailhead. Turn right (south) here and proceed to the trailhead. So you’ve found the trailhead. Now you need to find The Vortex. Little did we know how challenging that would be. While I always feel as if my directions are sufficient, they probably are not all you need to find it. I had previously read another fairly detailed blog about the hike and downloaded screenshots of a trail map produced by that blogger. Even with those maps and the cairns along the trail, this hike requires some trail-finding skills. I recommend reading a number of blogs or articles about this hike because all of us use different descriptions and some might be easier to understand than others. 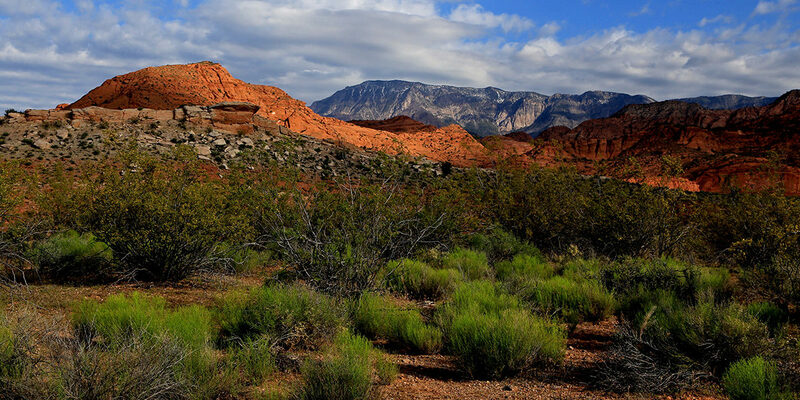 And don’t go into this hike expecting an easy-to-follow trail like you might find in Snow Canyon State Park or Zion National Park. Much of the trail is in a wilderness area and it hasn’t been hiked by thousands of people like the trails in more established areas. If you have the Google Maps app on your cell phone, it might also come in handy. My iPhone through AT&T went in and out of service along the hike, but there were areas where I was able to get a data signal and track where we were on Google Maps. I recommend Google Maps because it tends to be more reliable and accurate than Apple’s own Maps app. Plus, I know on the satellite version of Google Maps, it shows the actual location of The Vortex. We questioned this location when we neared it because it seems improbable. But the location was accurate. The trick was finding out how to reach The Vortex itself. Now for the fun part. From the trailhead, we hike southward through a landscape of dark igneous rock. The trail is faint here and difficult to see at times because it so rocky. But stay generally southwest and eventually it leads down into Sand Cove Wash. This picturesque wash follows a bed of white sandstone generally east/west where it intersects the trail. We are so enthralled by the wash that we start to follow it downstream but soon realize we’ve missed the point where the trail continues south of the wash. Later we realize that we should have simply crossed the wash and continued up the other side. While the wash might be enticing, the trail only crosses it — the trail does NOT follow it. On the south side of the wash, the trail continues southwest through a fairly verdant area. By desert standards, you would probably describe it as “thick” vegetation. But there are also some neat sandstone formations along the way. After a short jog to the southeast, the trail again turns southwest as it reaches a gently sloping hill of red sandstone. Here the trail becomes steeper as we follow the cairns upward along the slickrock. Soon it opens up into a wide valley of sandstone with colorful cliffs on all sides. Most prominent is a formation to the southwest with two white humps at the top. This is the Camelback. Without consulting the maps I had downloaded, we simply assume The Vortex is here somewhere in this valley so we start wandering around, looking in every slight depression to see if it’s The Vortex. While we see some spectacular geography, we don’t find The Vortex. That’s when I decide to consult Google Maps. When zooming in, I see that The Vortex is supposedly located immediately due south of the Camelback humps so we head that direction. Steve is ahead of me as we climb the Camelback ridge in a southwestern direction. I look up to see him scaling a fairly precipitous cliff. “This can’t be the trail,” I think. Steve has the same idea. So we decide to try and find a different way up. We hike northward, scaling another fairly steep cliff. I choose a route that requires me to use all fours. This brings us to a gorgeous spot just north of the Camelback with views toward Gunlock to the west, Lower Sand Cove Reservoir to the north and the Veyo Volcano to the northeast. Then we try hiking south along a ridge to the west of the Camelback. We’re sure this ridge will take us right to The Vortex. It doesn’t. Instead it ends just west of the northern Camelback hump. Another wrong turn. Even though we haven’t found The Vortex, Steve and I agree it’s still been a fantastic hike. In fact, we’ve loved every minute of it. But I decide to use a lifeline and phone a friend. I know my buddy Eric Dodge, the local country singer, has hiked The Vortex and has a good sense of direction when it comes to exploring Southern Utah. If anyone can help us, he can. Eric confirms that The Vortex is located exactly where Google Maps places it. However, we’ve gone the wrong direction in trying to get there. Because it’s located so high on the Camelback ridge, you get there in a roundabout way. So we return to the wide valley with the spectacular geography and start again. This time we take note of a sandstone formation rising directly to the south. Even though the Camelback is on the west (right) side of that formation, we instead head toward the east (left) side, where we soon see a cairn and begin to follow the trail southward once again. From this point the trail is actually fairly easy to follow. Just watch for those cairns, especially as the trail leaves the vegetation behind and begins its climb up the sandstone. There are some steep steps here, so anyone with balance issues might have a difficult time along this portion of the trail. I think I even have to use my hands once or twice to pull myself up. After climbing the sandstone to the southwest for a time, the trail doubles back and continues the climb to the northwest. Be watching for this direction change because the cairns are really the only indication of change. Once you turn and start hiking to the northwest, you are heading directly toward The Vortex. However, there are a number of waterpockets here on top of the ridge. So if it doesn’t look too impressive, you probably haven’t found The Vortex yet. You’ll know it when you see it because it’s quite steep and deep. Although we are happy to finally find The Vortex, we are also disappointed, even angered, to see how many people have carved their names into the sandstone at the bottom of the bowl. Dozens, maybe even hundreds of names are carved into this beautiful natural feature. I just don’t get it. Why would anyone deliberately scar nature in this way? Is the ego boost really worth it? Have they no shame? Thankfully there are some other beautiful spots up on top of the ridge to take my mind off the names. Northwest of The Vortex is another waterpocket that is shaped like a heart when viewed from certain angles. And another waterpocket at the base of the southernmost camel hump reflects the Camelback itself. We briefly consider trying to descend from this location but we’re not sure how steep it might get so we decide the safest bet is to return the same way we came. All in all, if you don’t wander around looking for The Vortex like we did, your entire hike should only be about 2.5 miles roundtrip. There is a lot of up and down along the way, so even at 2.5 miles I would say it’s somewhere between the moderate and strenuous scale. If you’re young, in shape and free from knee problems, it’s probably a moderate hike. Despite the trail confusion, it is easily one of the best hikes I’ve ever done. In many ways it’s up there with The Wave. Plus, this one doesn’t require a lottery that limits it to 20 hikers per day. For those of you who have been part of my BackTrek charity hike series in the past, I’m considering another trek to The Vortex during the month of October for the next hike in that series. If you’re interested in joining me for that hike (date still to be determined), send me an email on my gmail account at brianisawriter and include “BackTrek Vortex” in the subject line. Hey I got a shout out 🙂 good blog man. Of course! Thanks again for the help, Eric. Thanks for the beautiful pics of this hike. Looks like it’s a gorgeous & fun hike. Unfortunately, I’m one of those with “knee problems”, so it won’t be a hike I’m able to do. Loved your commentary and the pics. Hi Rita. If all goes well, I might also offer an easier hike next month too. I’ll be posting information here and on my professional Facebook page at Facebook.com/PasseyBrian. One can navigate past the camel back humps just below them along a narrow ledge on the steep slick rock slope, then descend on the north to a beautiful bench there, and then descend back to the valley below following a crack to the bottom. If you and I are ever out there, I’ll show you the best spot to reach that crevice as there is a bit of a slick-rock slope one briefly traverses. Thanks for the info, Aaron. I do hope to make it back there again sometime soon.